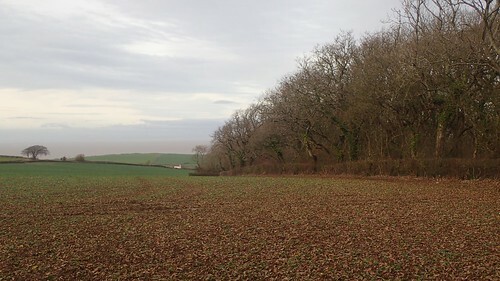 I decided to leave my car at the free-to-use car park at Lilstock; a few miles west of the-most-expensive-development-in-Europe-right-now… This meant driving through Cannington from Bridgwater and then negotiating a series of narrow country lanes before stumbling upon the permissive farm track. While I didn’t lose either of my boots at this early stage, I’d almost anticipated my car might lose a wheel, with so many potholes to manoeuvre around. 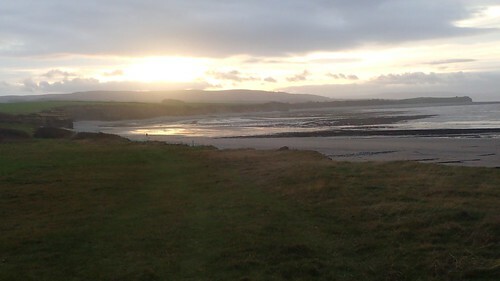 A short walk north from the car park and you’ll arrive at the coast. On this day, wind speeds were up in the high twenties, with gusts stretching close to forty miles-per-hour. 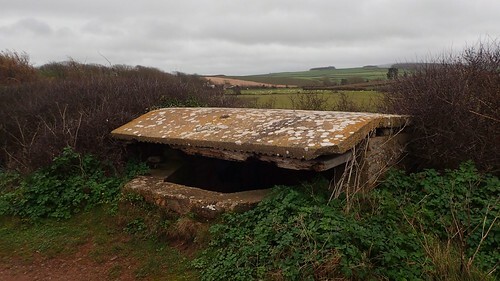 My walk began heading west and soon passing this probably pillbox, set beneath the level of what might be a defensive (if not naturally formed) bank of earth. Peering inside, I had to wonder: how much of this rubbish had been left with intention? 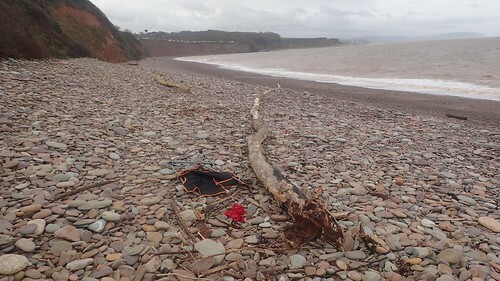 How much had been introduced by a high-rising tide? 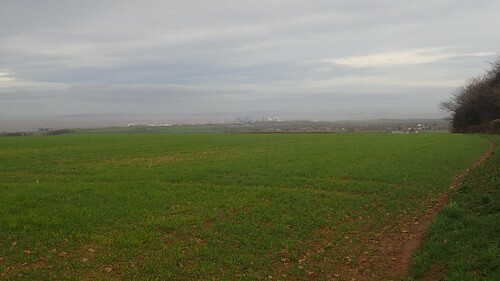 Away to the east is Hinkley Point C and the continued development of C… We may to that later, as the end of my walk was pass beside it. On the bay beneath me, brave fishermen had pitched up for the day. 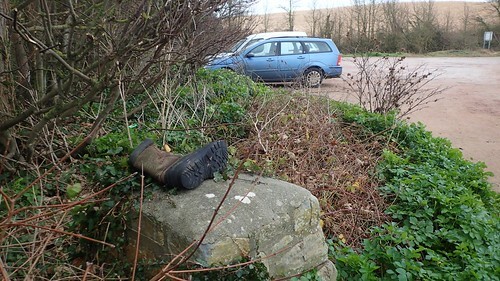 In fact, two of the cars who’d arrived at the car park before me would still remain by the time I would complete this walk and night had begun to fall. 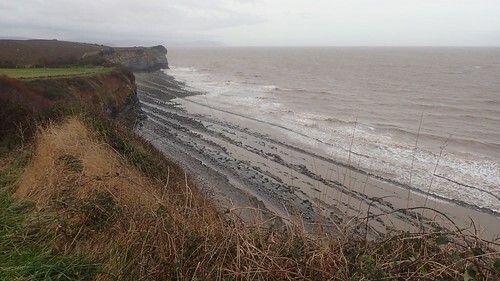 If you were to ask someone about coastal walks in the Somerset, I imagine they would first mention Weston-super-Mud, the lack of a coastal running north to Clevedon or south to Brean and perhaps, mention of the seven-mile stretch of sand between Brean and Burnham-on-Sea. 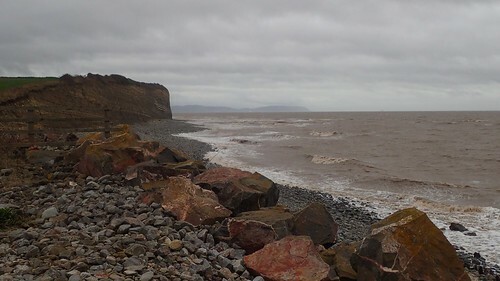 With the South West Coast Path beginning/ending a few miles further west at Minehead and the attraction of the Quantock Hills further inland, I get the impression that many people are unaware of how beautiful this stretch of coastline really is. 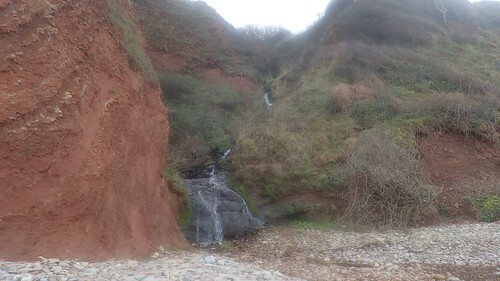 It may not offer the chalk-white cliffs of Dorset or Pemrbrokeshire-like ruggedness of the Cornish Coast. But for me, it beats walking along any flat and over-populated beach. While many would prefer to do a walk like this in good weather (and understandably so), there is something to be said for walking a coastline in winter and this is something I first realised in November 2017, during a trip away to Pembrokeshire in south-west Wales. 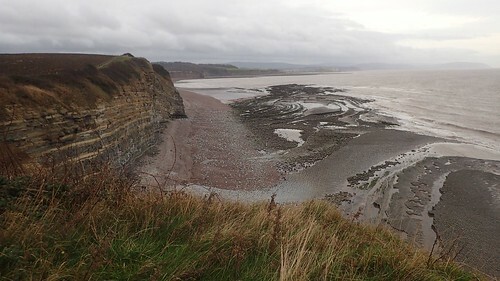 An hour in to my walk and with no escape from the elements, I reach the low-lying bay at Kilve, having past only two other people and one local walking their dog. There is also a car park nearby but I think it may be a pay-and-display affair. 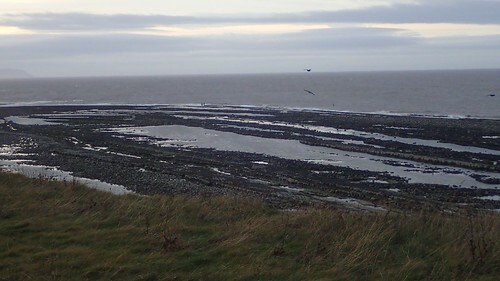 If you’re looking for a walk along the coast with the option of seating, Kilve is the place to come to as benches can be found up and down the slopes. 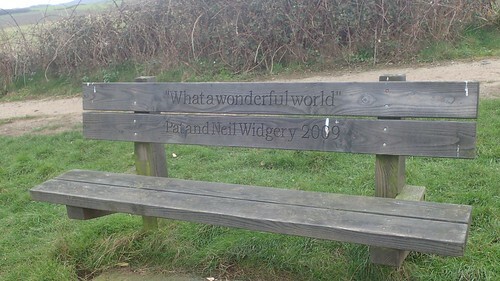 I took advantage of one bench, with my back to the wind and injected myself with the flavour of peppermint tea. Warnings of the route ahead are worth heeding. 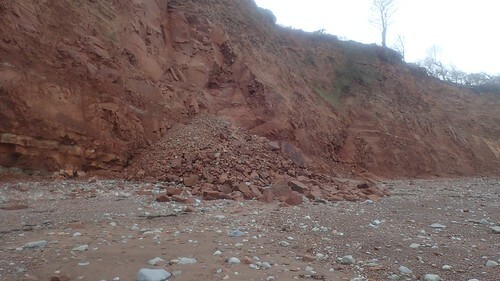 While I’ve not had any first-hand experience of the route being closed off by the tide, I remember hearing in the local news, maybe a year ago; of how the coast path was temporarily closed following a cliff fall. 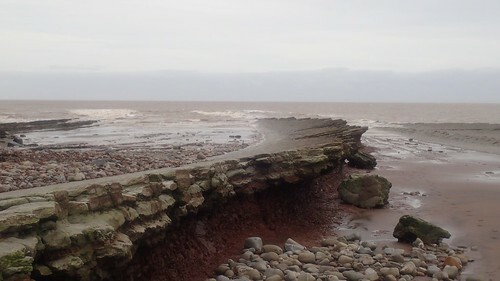 A few miles west from St. Audrie’s Bay and Blue Anchor is another area under the constant threat of coastal erosion. 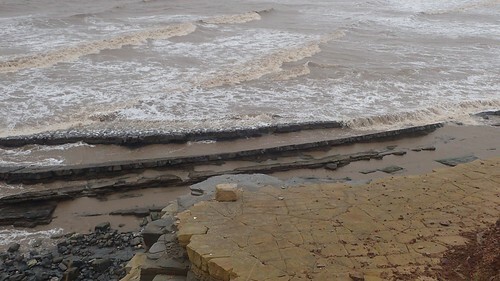 As you may’ve read in another post towards the end of 2018; the Blue Anchor Inn closed its doors in September, as the pub garden is set to imminently fall in to the sea. 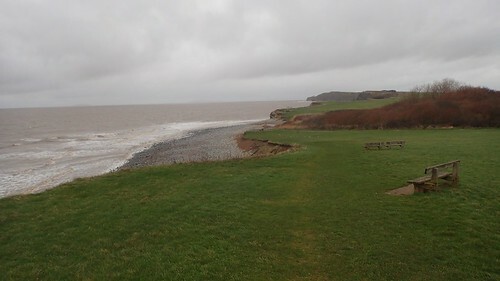 There was almost a mile still to walk before I would actually reach St. Audrie’s Bay and the path that runs along it. Even looking back from this point, the view was stunning. I could remember noticing this tree back in 2016, during a linear car-to-car walk with Anna. 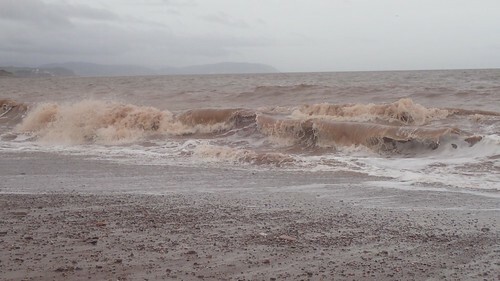 I think we finished at Blue Anchor on that day. 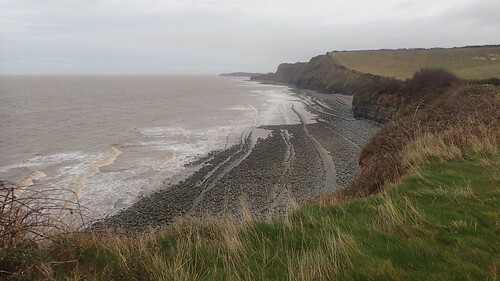 There’s also something to be said for a multi-day trek along a coast path. Walk with the head up and eyes open to the miles and days of footsteps ahead of you. That thought of ending one day and ‘knowing I was going to get up and walk tomorrow’ was a highlight of my experience along The Ridgeway National Trail last summer. 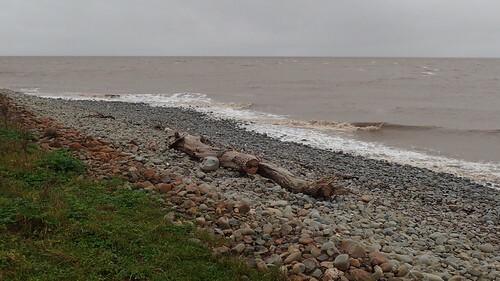 On to St. Audrie’s Bay. It’s not somewhere you’d encourage kids to take their spade and bucket. Neither is it a place for pop-up chairs, apparently. But it is definitely beautiful. Even with the holiday homes looming over the cliffs. My first thought was to head close to the water’s edge, where the surface was much easier to walk along than on the larger rocks higher up. 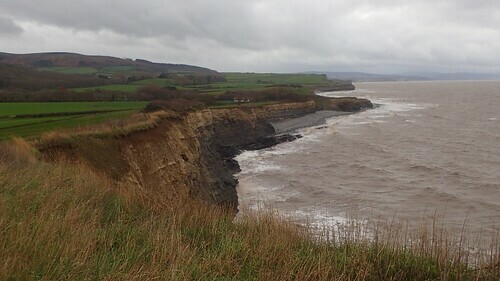 If faced with a situation where the tide had risen and cut-off access, I cannot see an alternative above-sea-level route available on the map. It would possibly mean turning back and there aren’t any alternative rights of way accessible nearby, as far as I’m aware. Worst case scenario: you’d have to work your way on to and along the A39. 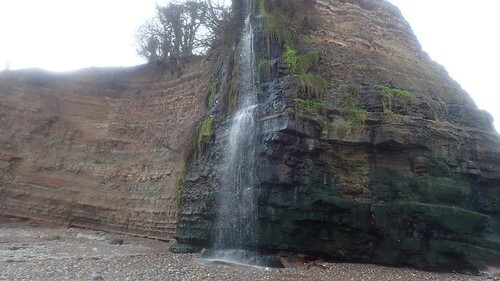 St. Audrie’s Bay is home to a small number of waterfalls trickling downs its cliff faces. 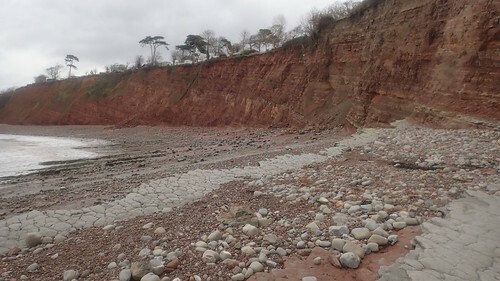 I really don’t know much about geology and erosion but I do wonder may lie in store for the future of the holiday parks that continue heading west along the coast from here. 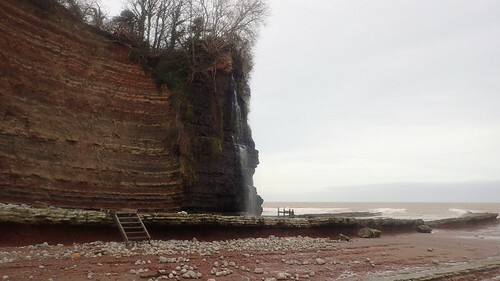 It may not compete with ‘waterfall of the snow’ in the Brecon Beacons but for a local discovery in Somerset, this is quite something. 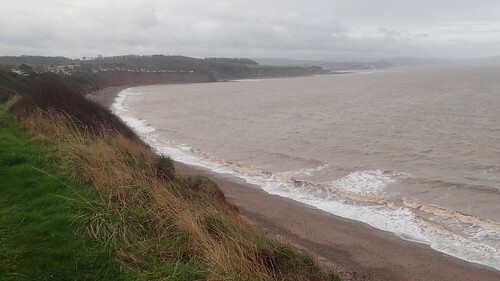 If you were to continue west from here, you’d reach the historic harbour of Watchet. 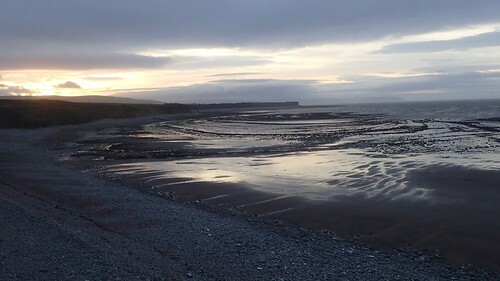 Otherwise, you would have to hit the roads in order to avoid the holiday parks… My decision was to turn back on myself, although I wouldn’t retreat quite as far as Kilve. Time was passing more quickly than I’d anticipated. Had I taken too many photographs? 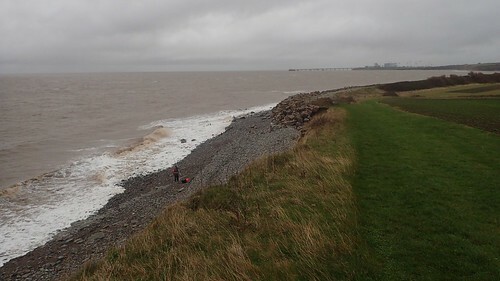 Spent too much time filming and allowed my camera and walking poles to be washed over by the tide?… I was (hopefully) around halfway in to my intended route and I’d realised it was lunchtime. Without pushing on and away from the coast path, I sat down close to Blue Ben and with this view for lunch. 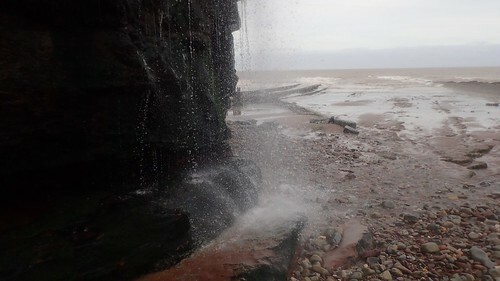 Despite the strong winds coming in off the Bristol Channel, I found myself able to rest here for a good half-an-hour. I lay back on the ground and could’ve easily fallen asleep, had I allowed myself. Some form of tiredness was creeping in and I still had a long way to walk. 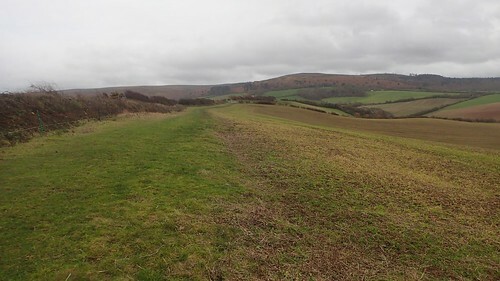 I soon joined a permissive footpath and followed this south across fields, in the direction of the Quantock Hills. 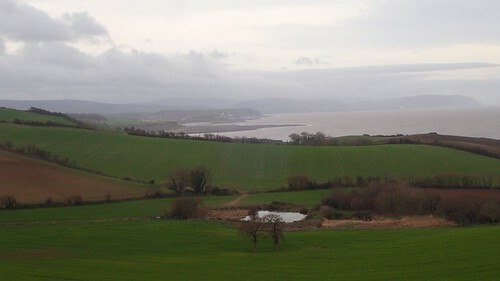 My views of this magnificent coast began to fade, as I turned inland towards East Quantoxhead. 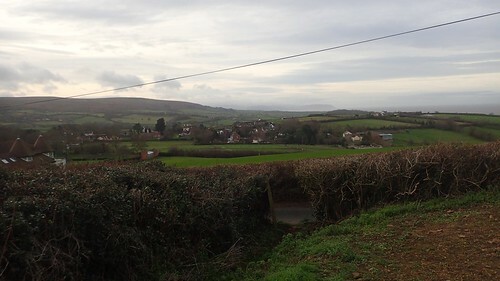 From there, my route would run east, crossing fields to reach the A39. Waymarking was in pretty good condition and I didn’t need to use much in the way of compass skills to find my way. 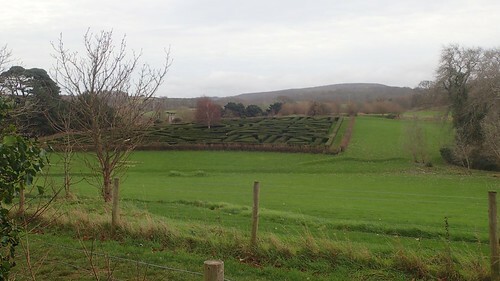 Dodging traffic, I was now walking in to Kilve, with a view of a maze away to my right – this might belong to Kilve Court. A muddy bridleway at the road bend led me on to Hilltop Lane. 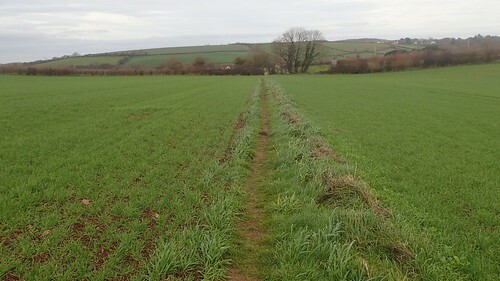 From tarmac, to bridleway and another road, I soon following a long cross-field path in to the parish of Stringston. 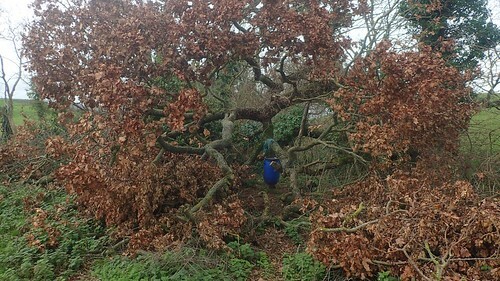 From the woods of Waltham’s Copse, I could almost see the coastline once more. Before breaking out the far side of these woods, a deer ran across the path. Five minutes later, I heard two gun shots from further down the hill… I hope they missed. 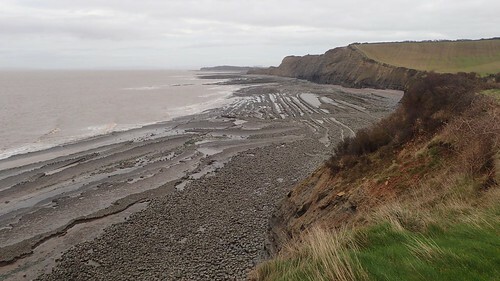 Hinkley Point is the undeniable eyesore of the West Somerset coast. Interestingly, I write this a few days after Hitachi have pulled out of plans to build and develop three nuclear power stations in the UK, which would’ve followed in the model of what’s being created here in Somerset. I like to think this decision will spark a first step away from thoughts of further nuclear nastiness. I get that nuclear power offers the best ‘fast fix’ solution but I strongly believe we need to move forward and away from it. I’ve said it before but my simplistic view is that we live on a small island battered by weather from all around. 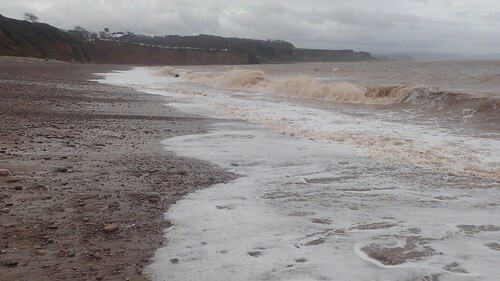 Here in the south-west, we experience the second-highest tidal range on the planet and I believe we should be investing in these ‘free’ and renewable sources of energy. Yes, it may be expensive and untried… As I imagine nuclear energy once was. Look at how lithium-ion technology now dominates the battery world and how much those initial high-prices have fallen over period of years. 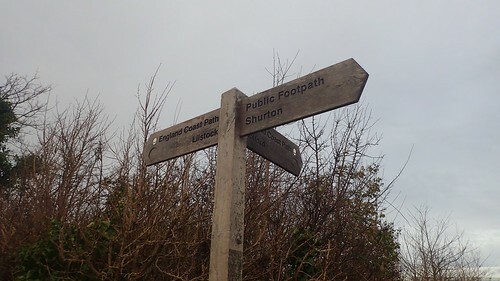 I followed the roads for almost two-miles, through Burton and in to Shurton, before turning left on to a footpath beside houses that was destined for the coast. 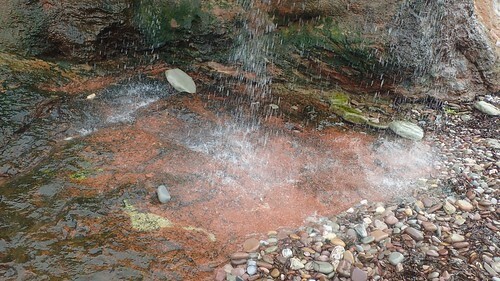 Passing a ford, I re-joined the England Coast Path. 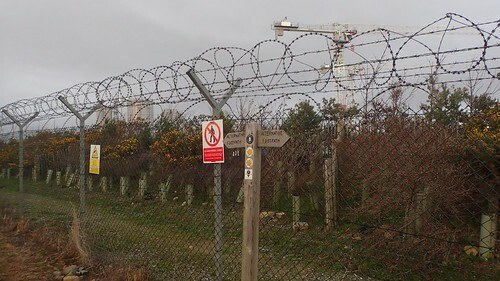 Albeit, the western tail-end of the awful diversion around Hinkley Point. 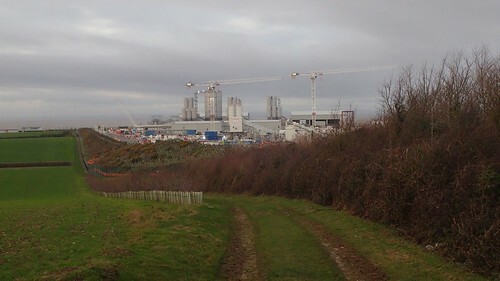 Development of Hinkley Point C has certainly come along since my previous walk here in 2016. There were no security patrols to speak of on this walk. Although, I did spot one white pickup truck, twice, that appeared to be travelling in circuits of the construction site. But it didn’t once slow down so that its occupant could observe me. Not this time. By now, the sun was beginning to set. I’d done well to begin my walk at 9:30, when I’m usually “cursed” not to start any walk before 10:00, it seems… But I couldn’t understand how it was already past 15:30. There was a risk that I would return to my car in darkness. 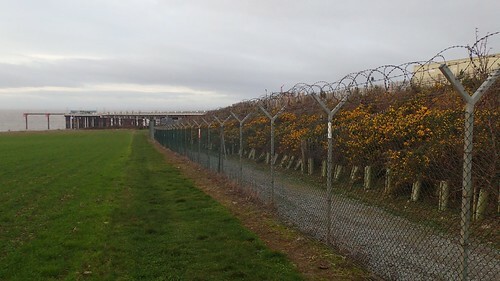 By the way, for anyone brave enough to scale the barbed wire fencing at Hinkley Point, they appear to be growing gorse as if it’s becoming extinct. Don’t do it in shorts and carry a pack of sausages for the guard dogs the signs speak of… I do wonder who and how ever walks along this fence-side path… It seems to be so far removed from the main facilities. 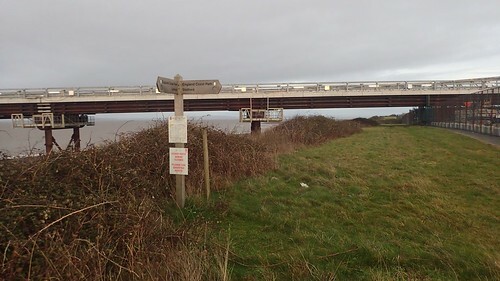 You may be mistaken for thinking you could just walk along the grass here and continue east towards Steart. For all I know, it may be physically possible to do this as I know the other end isn’t blocked off… It’s the space in between, I’m unsure. But I certainly wouldn’t recommend it. 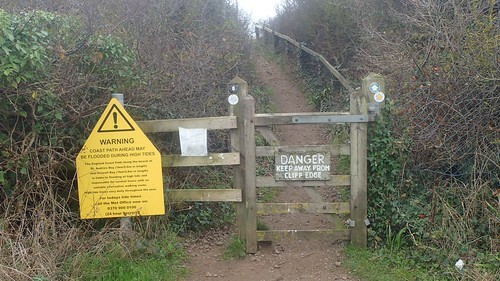 A pdf file from Natural England still states that this path is due to be closed until 14th March 2019… That’s this year! I’m not holding my breath as such, as there’s every possibility that something has or will be delayed. But I do hope it’s not too long before our access is restored and I’ll certainly be near the front of the queue to follow it. 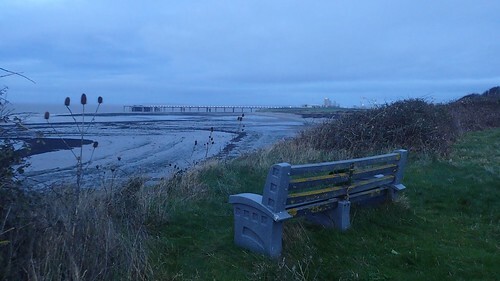 Down on the bay, I could see people lurking close to the sea. 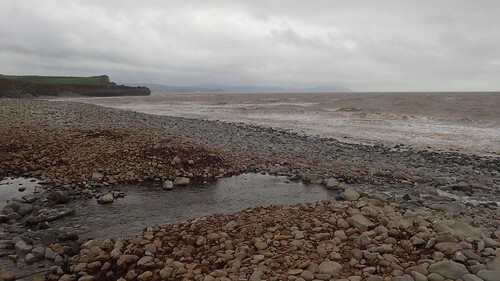 While I realised now that this has also been marked as a restricted area (not that any signs on the ground inform you of this), I was most concerned about their potential lack of awareness for how quickly the tide here can come in. 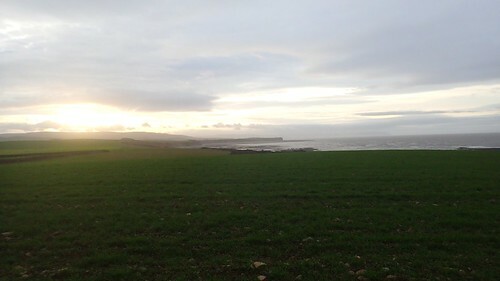 After a day of strong winds, cloud and the occasional splattering of rain, I found myself walking towards a warm sun as I closed in on the end of my semi-coastal walk. I managed to get back to my car at around 16:30. It was still light enough and, as I mentioned much earlier; two of the vehicles were still present from before my morning arrival. Somehow, I was shattered. This hasn’t been the most challenging of walks but physically, I was drained. This had been my first fifteen-miler since September, not that it was significantly hilly. I’d even packed my smaller backpack… Was I still walking off Christmas? Adjusting to the return to working life? Who knows. 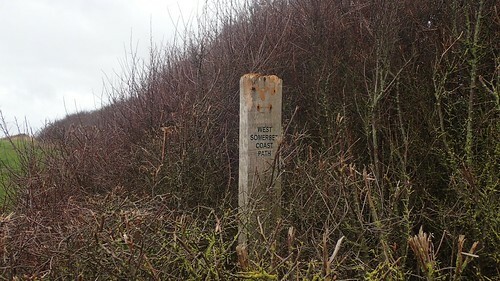 If you get the chance, I hope you’ll explore the West Somerset Coast Path. 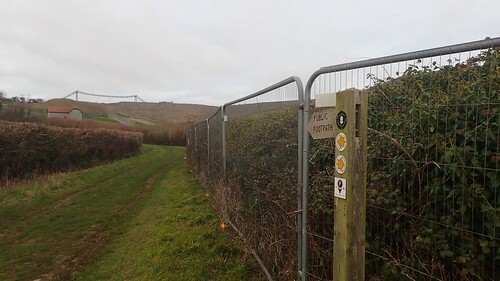 It is now part of the England Coast Path – which was originally supposed to be completed in 2020… We’ll have to wait and see on that one. 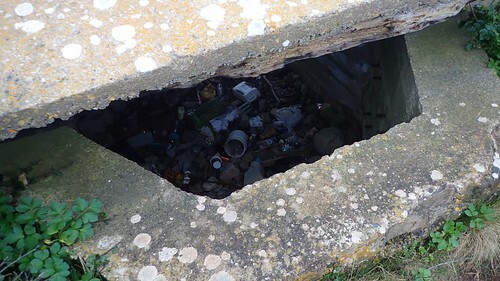 A fantastic collection of images here Olly, we particularly enjoy the coastal erosion shots, it’s a shame that people can’t take their litter away with them as well, despite the amount of awareness that us bloggers try and raise with regards to pollution and conservation/habitat management! Thanks very much for your comment and for reading. As I’ve said, it really is an underrated stretch of coast. Generally, this line was free of litter and waste. It all seemed to be in that pillbox. I sometimes wonder whether bins in public places are actually a bad idea, as the wind can often whisk the contents away and, when a bin is full, people often resort to a ‘less desirable’ alternative means of not taking their waste away with them. I imagine the SWCP could have greater problems with litter, for its popularity. What’s the address of your blog, out of interest? I’m guessing you’re not Carl from the YouTube channel of the same name? We are found at https://dartmoorexplorer.wordpress.com/, we usually end up taking others litter home to dispose of when out for a walk. You are right this seems to be a quite undiscovered stretch of the coast, with some spectacular scenery. 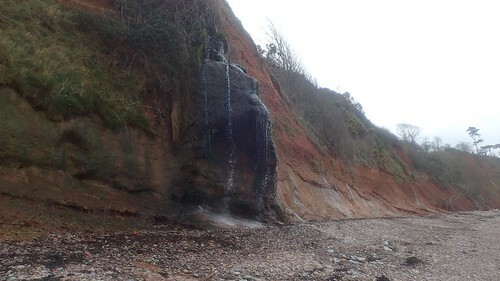 I did consider it quite under-rated when walking this stretch of the coast. 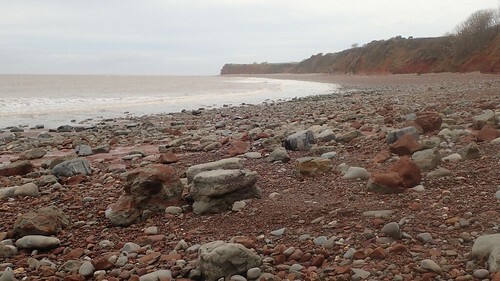 I actually stayed at the camp site at St Audrie’s Bay, it was quite a nice spot and a lovely beach, felt really quite remote, though the holiday park is big and the camping part very small. Sad that the Blue Anchor has gone, though.